- The heart wood pieces for crafts can be painted, stained, written on, glitter glued or simply leave them unfinished for your craft project. These craft wood cutouts are smooth and ready to decorate for your next special occasion, classroom projects, holiday crafts or for kids crafts. There are countless ways to personalize this wood cutout heart whether it's for group crafts, vacation bible school crafts, camp, church or crafts at home. 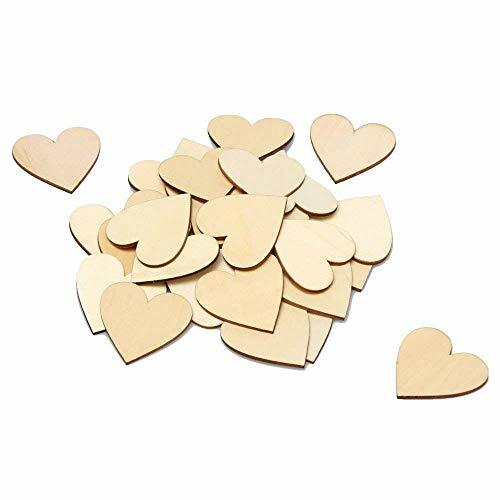 Adding a hole to these plywood hearts is simple; string them up for parties, dances, ceremonies or any special occasion. Our plywood hearts have been crafted into a lovely birthday banner, signs and glued with macaroni art; but the possibilities are endless! -100x 50mm Blank Heart Wood Slices Discs. If you have any questions about this product by RERIVER, contact us by completing and submitting the form below. If you are looking for a specif part number, please include it with your message.